"When did our country win its greatest fame upon the sea? When you have read stories of the War of 1812, you will say it was in that war. It is true, the United States did not do very well on land in that war; but the glory lost on the shore was made up on the sea. They grew so vain of their lordship of the sea that they needed a lesson, and they were to get one from the Yankee tars. As soon as war began between England and the United States in 1812, a flock of British war-hawks came flying bravely across the seas, thinking they would soon gobble up the Yankee sparrows. But long before the war was over they quit singing their proud song of "Britannia rules the waves," and found that what they thought was a Yankee sparrow was the American eagle. There were too many great things done on the ocean in this war for me to tell them all, so I will have to tell only the most famous. And first of all I must give you the story of the noble old Constitution, or, as she came to be called, Old Ironsides. The Constitution is a noble ship of the old kind. The royal old craft is still afloat, after more than [two] hundred years of service, and after all her companions have long since sunk in the waves or rotted away. She was built to fight the French in 1798. She was Commodore Preble's flagship in the war with the Moorish pirates. And she won undying fame in the War of 1812. So the story of the Constitution comes first in our list of the naval conquerors of that war. I believe, if any of you had been living at that time, you would have wanted to fight the British as bad as the Americans then did. For the British had for years been taking sailors off of American ships and making them serve in their own men-of-war, and they had often insulted our officers upon the seas, and acted in a very insolent and overbearing way when they had the opportunity. This made the Americans very angry and it was the main cause of the war. I must tell you some things that took place before the war. In 1811, a British frigate named the Guerriere made herself very busy at this kind of work, sailing up and down our coast and carrying off American sailors on pretense that they were British. I have also a story to tell about the Constitution in 1811. The ship had to cross the Atlantic in that year, and stopped on some business in the harbor of Portsmouth, an English seaport. One night a British officer came on board and said there was an American deserter on his ship, the Havana, and that the Americans could have him if they sent for him. Captain Hull, of the Constitution, was then in London, so Lieutenant Morris, who had charge of the ship, sent for the man, but when the lieutenant's messenger got there he was told that the man said he was a British subject, and therefore he should not be given up. They were very sorry, and all that, but they had to take the man's word for it. Morris thought this very shabby treatment; but he soon had his revenge. For that very night a British sailor came on board the Constitution, who said he was a deserter from the Havana. "Of what nation are you?" he was asked. "I'm an American, sir," said the man, with a strong Irish accent. Lieutenant Morris sent word to the Havana that a deserter from his ship was on the Constitution. But when an officer from the Havana came to get the deserter, Morris politely told him that the man said he was an American, and therefore he could not give him up. He was very sorry; he said, but really the man ought to know to what country he belonged. This was giving John Bull a bit of his own medicine. The officers in the harbor were in a great stew when they got this answer. They next tried to play a trick on the Americans. Two of their warships came up and anchored in the way of the Constitution. But Lieutenant Morris got up anchor and slipped away to a new berth. Then the two frigates sailed up and anchored in his way again. That was the way matters stood when Captain Hull came on board in the evening. When the captain was told what had taken place he saw that the British were trying to make trouble about the Irish deserter. But he was not the man to be cornered. He loaded his guns and cleared the ship for action. Then he got up anchor, slipped round the British frigates, and put to sea. He had not gone far before the two frigates were after him. They came on under full sail, but one of them was slow and fell far behind, so that the other came up alone. "If that fellow wants to fight he can have his chance," said Captain Hull, and he bade his men to make ready. Up came the English [Captain], but when he saw the ports open and the guns ready to bark at him across the waves, and everything in shape for a good fight, he had a sudden change at mind. Round he turned like a scared dog, and ran back, as fast as he had come. That was a clear case of the Americans getting even. No doubt, the Englishman knew that he was in the wrong, for English seaman are not afraid to fight. Home came the Constitution and got herself put in shape for the war that was soon to come. It had not long begun before she was off to sea, and now she had a remarkable adventure with the Guerriere and some other British ships. In fact, the ship made a wonderful escape from a whole squadron of war vessels. Constitution left Chesapeake Bay on July 12, 1812, and for five days sailed up the coast. The winds were light and progress was very slow. Then, on the 17th, the lookout aloft saw four warships sailing along close to the New Jersey coast. Two hours afterward another was seen. This proved to be the frigate Guerriere, and it was soon found that the others were British ships also. One of them was a great ship-of-the-line. It would have been madness to think of fighting such a force as this, more than six times as strong as the Constitution, and there was nothing to do but to run away. 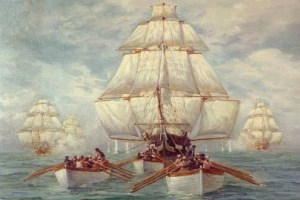 Then began the most famous race in American naval history. There was hardly a breath of wind, the sails hung flapping to the masts, so Captain Hull got out his boats and sent them ahead with a line to tow the ship. When the British saw this, they did the same, and by putting all their boats to two ships they got ahead faster. I cannot tell the whole story of this race, but it lasted for nearly three days, from Friday afternoon until Monday morning. Now there was a light breeze and then a dead calm. Now they pulled the ships by boats and then by kedging. That is, an anchor was carried out a long way ahead and let sink, and then the men pulled on the line until the ship was brought up over it. Then the anchor would be drawn up and carried and dropped ahead again. For two long days and nights the chase kept up, during which the Constitution was kept, by weary labor, just out of gunshot ahead. At 4 o'clock Sunday morning the British ships had got on both sides of the Constitution and it looked as if she was in a tight corner. But Captain Hull now turned and steered out to sea, across the bows of the Eolus, and soon had them astern again. The same old game went on until 4 o'clock in the afternoon, when they saw signs of a coming squall. Captain Hull knew how to deal with an American squall, but the Englishmen did not. He kept his men towing until he saw the sea ruffled by the wind about a mile away. Then he called the boats in and in a moment let fall all his sails. Looking at the British, he saw them hard at work furling their sails. They had let all their boats go adrift. But Captain Hull had not furled a sail, and the minute a vapor hid his ship from the enemy all his sails were spread to the winds, and away went the Yankee ship in rapid flight. He had taught his foes a lesson in American seamanship. When the squall cleared away the British ships were far astern. But the wind fell again and all that night the chase kept up. Captain Hull threw water on his sails and made every rag of canvas draw. When daylight came only the top sails of the enemy could be seen. At 8 o'clock they gave up the chase and turned on their heels. Thus ended that wonderful three days' chase, one of the most remarkable in naval history. And now we come to the greatest story in the history of the Old Ironsides. In less than a month after the Guerriere had helped to chase her off the Jersey coast, she had given that proud ship a lesson which the British nation did not soon forget. Here is the story of that famous fight, by which Captain Hull won high fame. In the early morning of August 19th, 1812, while the old ship was bowling along easily off the New England coast, a cheery cry of "Sail-ho" came from the lookout at the mast-head. Soon a large vessel was seen from the deck. On went the Yankee ship with flying flag and bellying sails. The strange ship waited as if ready for a fight. When the Constitution drew near, the stranger hoisted the British flag and began to fire her great guns. It was the Guerriere. When he saw the stars and stripes Captain Dacres said to his men: "That is a Yankee frigate. She will be ours in forty-five minutes. If you take her in fifteen I promise you four months' pay." It is never best to be too sure, as Captain Dacres was to quickly discover. "The British have killed two of our men. Shall we return their fire?" "Not yet," said Captain Hull. "Wait a while." He waited until the ships were almost touching, and then he roared out: "Now, boys; pour it into them!" Then came a roaring broadside that went splintering through the British hull, doing more damage than all the Guerriere's fire. Now the battle was on in earnest. The two ships lay side by side, and for fifteen minutes the roar of cannon and the rattle of musketry filled the air, while cannon balls tore their way through solid timber and human flesh. Down came the mizzen mast of the Guerriere, cut through by a big iron shot. "Hurrah, boys!" cried Hull, swinging his hat like I a schoolboy:; "we've made a brig of her." The mast dragged by its ropes and brought the ship round, so that the next broadside from the Constitution raked her from stem to stern. The bowsprit of the Guerriere caught fast in the rigging of the Constitution, and the sailors on both ships tried to board. But soon the winds pulled the Constitution clear, and as she forged ahead down with a crash came the other masts of the British ship. They had been cut into splinters by the Yankee guns. A few minutes before she had been a stately three-masted frigate; now she was a helpless hulk. Not a half-hour had passed since the Constitution fired her first shot, and already the Guerriere was a wreck, while the Yankee ship rode the waters as proudly as ever. Off in triumph went the Constitution, and hasty repairs to her rigging were made. Then she came up with loaded guns. The Guerriere lay rolling like a log in the water, without a flag in sight. Not only her masts were gone, but her hull was like a sieve. It had more than thirty cannon-ball holes below the waterline. There was no need to fire again. Lieutenant Reed went off in a boat. "Have you surrendered?" he asked Captain Dacres, who was looking, with a very long face, over the rail." "It would not be prudent to continue the engagement any longer," said Dacres, in gloomy tones. "Do you mean that you have struck your flag?" "Not precisely. But I do not know that it will be worth while to fight any more." "If you cannot make up your mind I will go back and we will do something to help you." "I don't see that I can keep up the fight," said the dejected British captain. "I have hardly any men left and my ship is ready to sink." "What I want to know is," cried Lieutenant Reed, "whether you are a prisoner of war or an enemy. And I must know without further parley." "If I could fight longer I would," said Captain Dacres. Then with faltering words he continued, "but, I—must—surrender." "Then accept from me Captain Hull's compliments. He wishes to know if you need the aid of a surgeon or surgeon's mate." "Have you not business enough on your own ship for all your doctors?" asked Dacres. "Oh, no!" said Reed. "We have only seven men wounded, and their wounds are all dressed." Captain Dacres was obliged to enter Read's boat and be rowed to the Constitution. He had been wounded, and could not climb very well, so Captain Hull helped him to the deck. "Give me your hand, Dacres," he said, "I know you are hurt." Captain Dacres offered his sword, but the American captain would not take it. "No, no," he said, "I will not take a sword from one who knows so well how to use it. But I'll trouble you for that hat." What did he mean by that, you ask? Well, the two captains had met sometime before the war, and Dacres had offered to bet a hat that the Guerriere would whip the Constitution. Hull accepted the bet, and he had won. All day and night the boats were kept busy in carrying the prisoners, well and hurt, to the Constitution. When daylight came again it was reported that the Guerriere was filling with water and ready to sink. Guerriere could not be saved, so the ship was set on fire. Rapidly the flames spread until they reached her magazine. Then came a fearful explosion and a black cloud of smoke hung over the place where the ship had floated. When the cloud moved away only some floating planks were to be seen. The proud Guerriere would never trouble Yankee sailors again.